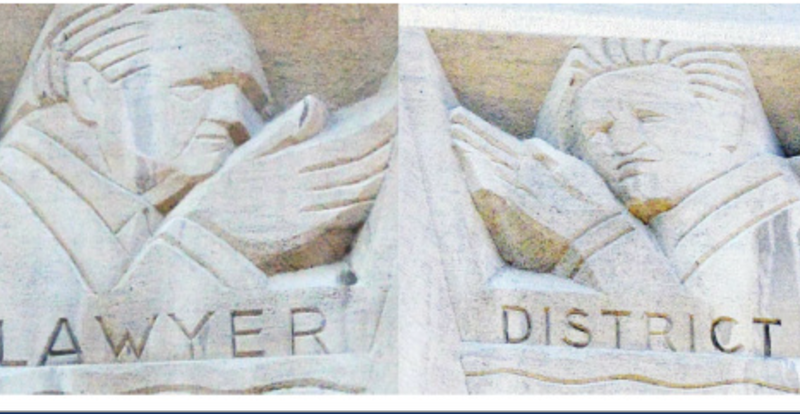 These images are carved on the exterior of the Winnebago County Courthouse, where the criminal case against two former officials of the University of Wisconsin Oshkosh is scheduled to resume next month. With two former top officials of UW Oshkosh due back in court next month, the new attorney general is reviewing the criminal and civil cases against them. “The Department of Justice is evaluating the appropriate disposition of these matters,” said Rebecca A. Ballweg, the agency’s deputy director of communications. The review comes in the wake of an agreement between the UW System Board of Regents and the UW Oshkosh Foundation to resolve their differences. The foundation has submitted a plan of reorganization that, if approved at a scheduled March 25 hearing, would allow it to emerge from bankruptcy. The two UW Oshkosh officials, former Chancellor Richard Wells and former Vice Chancellor Thomas Sonnleitner, have been accused of acting improperly in facilitating financial arrangements between the foundation and the university. They are scheduled to return to Winnebago County District Court on April 2 for a status conference on their case. The accusations against the two, contained in separate criminal and civil cases, rely on a reading of the Wisconsin Constitution that has been rejected by both federal and state courts as the foundation case has developed. Without that legal support for its position, the state faces a challenge in advancing the charges against Wells and Sonnleitner. The UW Oshkosh cases were brought by the Department of Justice when it was led by Republican Brad D. Schimel. He was replaced by a new attorney general, Democrat Josh Kaul, who was elected last fall. The civil case seeks the recovery of “actual damages” suffered by the UW System because of actions taken by Wells and Sonnleitner. But late last year, the university regents said in a statement that they were “pleased” to take over two real estate projects at the UW Oshkosh campus. This language of the regents' announcement suggests hat there were no financial losses suffered by the school when the value of the buildings is compared to cash outlays. To succeed in the criminal case, the state would have to show that Wells and Sonnleitner had acted in a way that was inconsistent with their job duties and that showed an intent to obtain a “dishonest advantage.” These standards are based on a previous public corruption case that went to the state Supreme Court. By contrast Wells, for example, has argued that any actions he took to transfer funds from the university to its foundation were within the scope of his authority. He has also argued that his actions “conferred a benefit” upon the university based on its construction of real estate assets that have been used to help the school and its students. Raymond M. Dall’Osto, Wells’ attorney, did not respond to a request for comment.